At last construction has begun on the Applebee and Lavender line. It has taken time. Every time I ventured to the shed to make a start something else cropped up that needed my attention. Today was the day. 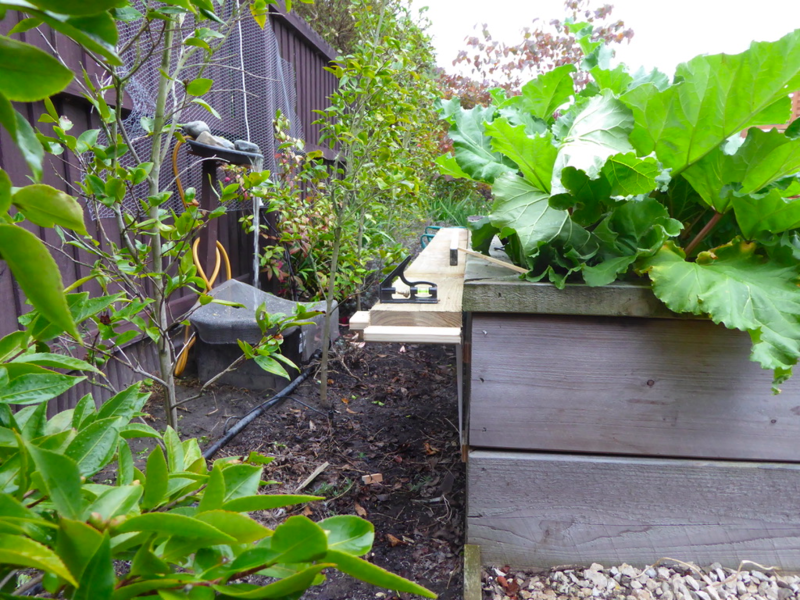 I got the tools out of the shed, screwed one bracket to the back of a raised veggie bed and the heavens opened. But it is a start. The track bed is 150mm x 25 mm tanalised timber that will be painted to match the fence behind. It impossible to get hold of roofing felt here in NZ. Does not seem to exist here so the boards will be painted with fence paint instead. Once it clears the veggie bed it will be supported by 100x100 mm posts concreted into the ground. Decking board mounted vertically and screwed horizontally between the posts will support the boards on top. Hope that makes sense. Future phots will show what I mean eventually. I have taken note of all the comments about distance between supports, warping and so forth and hope I have it all covered. Time will tell. Morning Mark, a new garden railway is well under way making the first start , be looking forward to seeing lots of pics of the big build , going by your yard pics the back yard is flat, making it a lot easier in the construction, are you going to venture outside the veggie garden, like the raised gardens best for growing veggies,. That is interesting you umpiring a loco cricket match, do you have to do a course to become an umpire or just experiences in playing the game, I used to play club cricket . Love your layout name , how did you go with that cyclone Linda , we copped bad winds, go down the coast for a holiday and couldn't do any surf swimming all the beaches were closed all week , Gold Coast, couldn't even go on a walk around Burleigh mountain on the lower path was closed due to the strong winds, will have to go back on a day trip, gee Burleigh beach sure has changed sine the 80's. Keep the pic flowing, Tony from sunny and warm down under, keeping on moving ahead. we got the tail end of Cyclone Linda. Just some cloud and a bit of rain. Nothing compared to what Oz got. I regret to inform you that everywhere has changed since the 80's not just Burleigh beach! 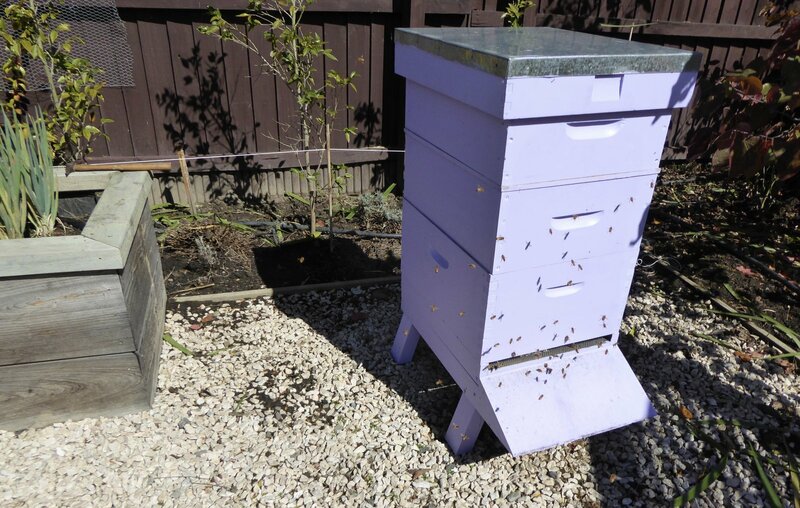 The intention is for the line to progress beyond the veggie patch to pass behind the beehive and under the purple tree ( a forest daisy....part of the dogwood family apparently) in the top picture into the garden proper. That bit will be on 100x100 posts. The section is about 21 metres by 10 metres. The layout got its name from the beehive, behind which the line will pass, the espalier apples under which a station will be built protected from falling apples! and the lavender bushes through which the line will pass. They have been cut to ground level to facilitate laying the boards behind the veggie patch but will come back next year. Great food for the bees. I am hoping to get back into the garden tomorrow to finish off the section behind the veggie patch and get the first post holes dug. I played cricket when I lived in the UK for Trowbridge and then became an umpire when age slowed me down. I did some training in the UK and converted my licence to New Zealand when I moved here. Just love keeping involved with the game. I know Oz is a short of umpires as we are here. They could do with more. Give it a go. You will love it. Here are the pictures of todays efforts. If you see something I am doing wrong please say so. Better to pick up any goofs now. Hi Mark,, coming along nicely with the second effort. can get quite a bit done in one day, the way you are going you will have track down and running a train before me, my build is slow going will get there, haven't heard of that ply is it water proof ply or concteters ply, i use 12mm ply. Don't know how I will go umpiring, got a weak bladder, do you get breaks at all, something i could do later . .Back to my layout construction tomorrow, keep those pics flowing, nice clear pics what brand is your camera. Its pressure treated wood. In NZ and maybe Oz as well It comes marked as H3.2 treated or maybe even 4. Its the same thing. In the UK we called it tanalising because of the chemical used I think. Hoping it will help keep the rot at bay for a while. I only used 18mm as it was on sale being big offcuts. Big enough for what I wanted but not entire sheets. The camera is a lumix point and shoot. Nothing fancy. I need to buy track. Its very expensive here in NZ. I am in the UK for 11 days in April before joining my ship again and have a shopping list. I am hoping to visit a model shop in Liverpool and stock up on tracks and points. I am going to use insulfrogs. Thought about electrofrogs but many posts here talk about people going to insulfrogs for simplicity. Thats me! Electrofrog only makes sense where you drive slowly with short vehicles with little wheels who can take the power from the rails. Or if you use very large turnouts with a low frog angle where the frog is very long. There is a device called Frog-Juicer that can do the polarization easily when driving DCC Digital. I have a couple of high speed switches with a moving frog. With these you can not avoid a polarization. The Frog Juicer does me very good service. I tried to google frog juicer but cant find too much on it. Can you let me know how it works please? Is it for electrofrog points a bit like a polarity switch? The geometry of the curve into the shed is not a constant radius due to the relative positions of where I want the railway to enter the shed and a fence post upon which the board will sit. But please. 4 hours it took me. 4 hours in 27C heat. There were some choice words I can tell you. My son Leo, came out after 3 hours of struggle and said "Duh, why dont you cut a paper template first!" So armed with a few pieces of flexible track and a few sheets of news paper stuck together with tape a template was duly made and the plywood cut. It did not fit. So a bit of judicious hacking with a jigsaw and voila. I have what I set out to do 4 hours earlier. I cooled off with a visit to my local model shop, Iron Horse hobbies in Christchurch. There are so many pretty things to buy. I resisted. Wood needs buying first. And curves can be really mean. My first curve in the garden costs me months, especially as it fell victim to the weather (and neighbor's tree), barely finished. The second attempt, made with a CNC milling machine, has survived the winter so far. Morning Mark, great idea in marking out and cutting a template first, I do the same as well before cutting the ply deck, mostly mare out the curve on the concrete, yes making it difficult with a post in the way, I have the same issue, i cut into a module so the next one fit flush on the pergola post, working out well . Nice bit of work there cutting the curve out, sadly wasting so much ply, I try to save as much as I can, and go to timber mobs that sell cheaper ply, good idea as well buying treated ply, my layout being a modular set up wont have that issue in rotting . Are you going DCC , I would like to stuck with DC, taking loner to wire up with all those blocks, just as much fun and four throttles , will only be three with a spare position on the rotary switch, posting some more pics on the latest point and corr overs work later on my post. Today the plywood curve fashioned yesterday was fixed in place between the existing railbed and the shed. I need to make some leg supports for it and run some longitudinals under the plywood to strengthen it.Then a cold front passed north up the south island of New Zealand and the temperature dropped from 24 to 10C. That was enough to call it a day. Autumn is just around the corner for us. The vernal equinox heralds spring in Europe so you will all be track cleaning and loco servicing I reckon ready for your summer season. That looks like great progress, Mark, and I hope we'll be able to see more fine photos in due course. As for any covering of your base boards such as roofing felt, since they've been pressure treated you might fine it's alright just to lay your track straight onto the timber - and it might look nicer too as the wood will probably weather to a darker and realistically uneven colour. I prefer the appearance of curved baseboards, but they certainly need a bit of forethought and effort. Enjoy the shopping when you get to Liverpool! We look forward to seeing the results. I love the look of your track on your boards. I am going to go with bare boards for now as you say and see how it goes. Now that I have made my first curved board the others should be easier. They will be a standard radius of a minimum of 6 feet from now on as I have the room in the open garden. Behind the shed was a made to fit radius which varied throughout the curve. Thats what I am hoping anyway. I have another wood to try. Its Kwila. A bit expensive but I am going to lay a test piece and see how it fairs beside the others. The other top boards are 150mm wide. I need to restrict them to 100mm for the rest of the garden so that they dont become a visual eyesore among the borders. Morning Mark , agree since those boards are treated won't need to paint them and you could later sprinkle some ballast beside the track, the kwila wood is it treated as well, I am sticking to 12 mm ply keep the prices down,, hard working on a budget. Don't forget to put on the pics of the curve, gives everyone ideas for their build, I be starting up a new post in Members workbench on the bridge build, which is well under way, rest day today but do plan to look at redesigning the bus wire plug panel , the aim to set the modules up very quick. 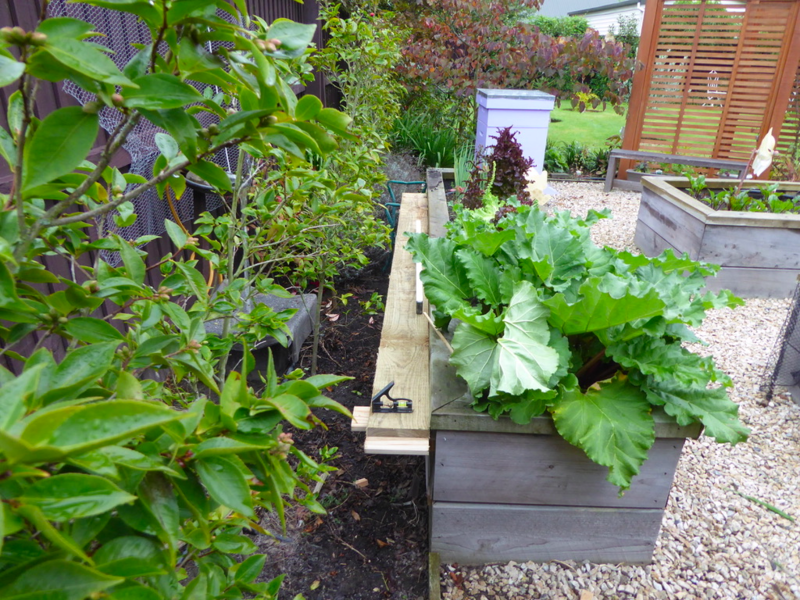 Have you started cutting out the square hole on the side of your shed yet. It is sunny here, you watch because I am not working on my layout it wont rain. The past two days I have been busy getting the corner plywood curve fitted and cutting out the hole into the shed. It is a metal shed so I used the angle grinder to cut the hole and fitted a plywood back to the cutout bit for strength. Big mistake. The angle grinder was too vicious but it cant be "uncut" so I will have to live with it for now. I dont have a dremel which would have been a bit more delicate lets say. Pop riveted a hinge and thats done. That gives me a level in the shed now for the storage yard boards. I will construct those on my next leave starting in July which is our winter in New Zealand. I had to contend with a busy beehive whilst sinking the posts into the ground. I have also had to adjust the line of the posts to skirt around an old rose bush behind the beehive that is 'too precious' to dig out. (not my words and a battle I was not going to win!). It has been too hot and humid here to work outside past 2pm. Not what you want to hear in the distant shores of freezing Europe I know. Being an expat Pom I have also been watching the test match cricket here in NZ. Great game! When I moved here 15 years ago I said I inherited a great rugby team but a shocker of a cricket team. My opinion may change! Notices you have bees, we have not seen a bee here in years, there may of being a disease, I am going the Council plant nursery to get my 6 free plants. It wont be long before you are running trains, I better get a move on, was busy as well today, a couple of progress pics on my post. What are you talking about a shocker of a cricket is it to do with what has happened in South Africa , can we come back. I have decided that the stock on the Applebee and Lavendar line will represent my life. Its going to be a right old mish mash of locos but thats just fine by me. Each one will have a story and memories with it. I was born in Portsmouth in the UK in 1960 and my mum and dad would take me on the Hayling Island line to the beach in the early 60s. Rails of Sheffield have pre-released an A1X terrier loco which is exactly what the Hayling Island 'Puffing Billy" was so I have pre ordered one in the early BR crest. They are to be made by Dapol which will be a first from that manufacturer for me. Other locos I hope to get will be a class 55 deltic as I spent some years growing up in the North East of England and would stand at the side of the railway near a place called Killingworth feeling the earth move as a Deltic would thunder by on the East Coast mainline. Got to get a Black Five as that was the first loco my mum bought me as a kid. Its long gone now but another is a must. There are others but they can wait for now. So here are a few photos of todays efforts. The battening is 50x25mm battening and once its all dry I will screw it to 12mm ply top on and fit it into the shed. Constructing the frame on the concrete floor kept it true as the floor is level. Made life a lot simpler. I drilled some holes in the cross bracing though which I can run the bus wires later.I dont know about you but there is something immensely satisfying working with wood. Cant put my finger on it but drilling and glueing and screwing it all together but quite cathartic! You get ahead quickly Mark. And I envy you for the weather at the moment.